Koalas are marsupials, so their young are born tiny and crawl into the pouch to develop. Finally we can see a lovely pouch bulge on Maxine - the next generation of hope! Thank you for the awesome comments and questions on my photos. So wonderful, looking forward to follow this story! Looking forward to following the progession of Maxine's joey. No wonder she is enjoying a good stretch. It looks a lot like a technique we used to use to shinny up what are called “chimneys” on a Yosemite granite cliff. 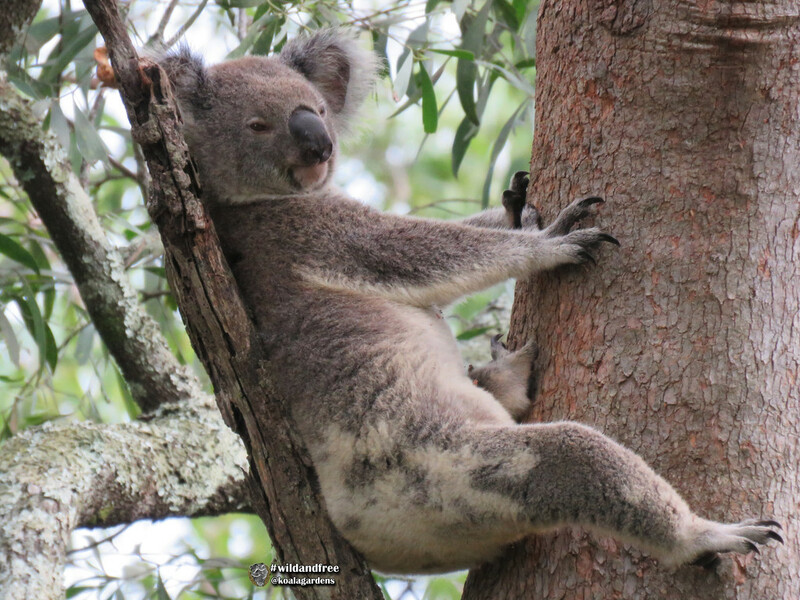 A koala in a recliner :-) Great capture! I bet that feels good on her back! When will we see the baby? Maxine looks so relaxed ...and preggers! Can't wait to meet the baby. She looks totally content in her relaxed position. Nice shot. The koala`s alway`s ameze me with the choice of relexing places. She does look quite relaxed there (how I can't relate to!) and how exciting to see her little pouch - will be awaiting a new koala to your photos. She looks strong pushing against the tree - an exercise in itself ! @koalagardens do the females have a joey each year? Are last year’s girls still too young to be moms? @kchuk pretty much every year Elyse. Sometimes they get to miss one year, but I think it's not too often. How exciting.....Maxine certainly looks laid back...or maybe she has an aching back...Great capture. @ludwigsdiana yes, they are related to the wombat and kangaroo :) I often find out all kinds of things here, such fun! Awww she looks so cute and comfy there! What a great shot. She looks so comfortable. @kklinck I would imagine around June-July we will see joey first starting poking a head out of that pouch :) not too far away really! Fantastic! Wonderful mummy in a relaxing pose!